A 1950s love letter has been returned to the woman who wrote it to her future husband more than 60 years ago. 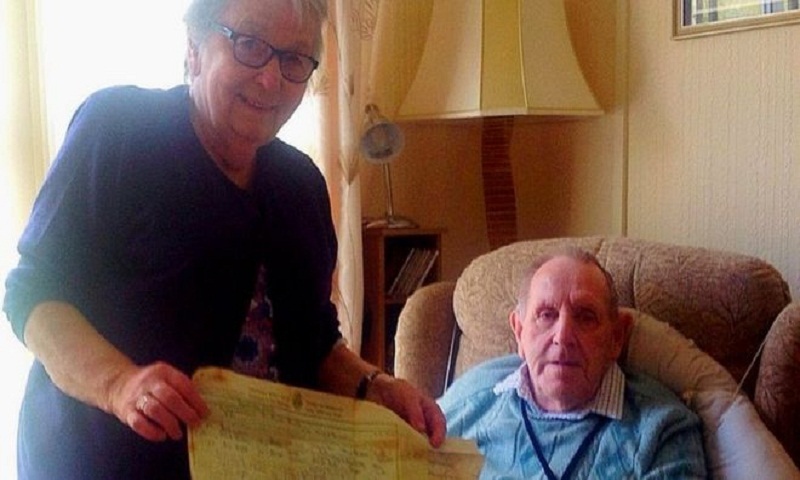 Louie Edyvean, 79, put it in a sugar jar with her marriage certificate but gave it to a charity shop by mistake after downsizing five years ago. The china pot was bought by Cornwall resident, Cathy Davies, who gave it to her friend Lizzie Dixon. She found the love letter after accidentally smashing the jar on the ground at her home in Roche. Ms Davies put photos of the love letter and marriage certificate on a local Facebook group page, and says hundreds of people replied offering to help track the couple down. A member of their family spotted the post within five hours of it being posted and got in touch. "I never thought we'd find them," she said. "To actually find the couple was amazing. "A friend of mine rang me and said, 'I think I know the daughter-in-law'. She was called Michelle Edyvean, which was the same surname as the elderly couple." Ms Davies says she was then invited around to their house and personally delivered the love letter back to Derek and Louie. "I went up the road, found their little bungalow, knocked on their door, and they invited me in," she said. "They were the cutest couple. "Louie hugged me and said, 'You're the lady who's been looking for us'. "I gave it to them and they couldn't thank me enough. I left in tears and cried all the way home." Louie says she made a copy of their wedding certificate in 1961 after misplacing the original, which was in their antique sugar shaker all along. She celebrates her 80th birthday next week after writing the love letter when she was a teenager. When a love letter for Deepika Padukone turns a lesson!